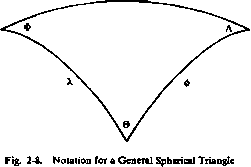 The rules of spherical trigonometry are considerably simplified in the special cases of right and quadrantal triangles. A right spherical triangle is one in which one of the rotation angles is 90 deg. A quadrantal spherical triangle is one in which one of the sides is 90 deg. In both cases, the relations between the five remaining sides and angles are given by a set of rules developed by John Napier, a 16th-century Scottish mathematician. These are presented in Appendix A. Napier's Rules and the laws of sines and cosines are particularly useful in attitude analysis and frequently provide simpler, exact analytic expressions than are available from plane geometry approximations. Napier's Rules may be derived from the law of cosines or may be used to derive it. In this case, the equation cannot be evaluated directly, since cos^ = 0 and tan^ = + oo. Because r=60°, y=arccot(0.5)=63.42o. 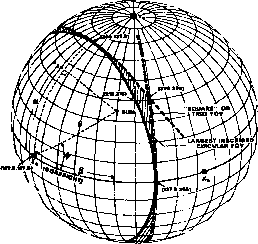 (This suggests why the field of view of solid angle Sun sensors is often approximately a circle of 64-deg radius.) This analysis remains valid for a Sun sensor at each pole and any number of sensors (greater than 1) uniformly distributed about the equator. 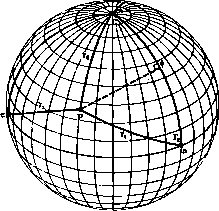 Thus, with a total of six sensors, four are distributed along the equator, r=45°, and y=arccot^ =54.73°.